Telepresence — the next best thing to being there — and sometimes better. Telepresence has become a very intelligent business strategy, especially for companies that are spread across multiple sites or for those that have clients in many locations that they need to deal with on a fairly regular basis. Using what is in essence a fairly simple robot, anyone can transport himself to another location, move around through offices and interact face to face with people they might not otherwise ever meet. Granted they’re going to look something like large iPads held up by a couple metal rods riding on top of self-propelled vacuum cleaners, but the experience is still surprisingly effective. I recently had a chance to transport myself using one of the Beam presence systems built by Suitable Technologies. I sat in my office in the mountains in Virginia while being transported to an office suite in Palo Alto, California, and interacted with two members of the staff. I had previously spoken with one of the same company’s customers at yet another location to get a feel for how they were using their Beams. During my telepresence visit, I operated both the Beam and the BeamPro. Each device allowed me to move around the suite, test the controls and look around. How did it feel? It was surprisingly easy to maneuver my way around the office space. With two views of the space — one that looked straight ahead and one that looked down at what would have been my “feet,” it was easy to avoid bumping into desks, running into walls or hitting anything on the floor. In fact, with just minor instructions, I was soon in charge and moving confidently about on my own. Beams are unable to deal with stairs, but they roll easily around offices with considerable speed. In fact, I was able to spin around in place and move around at a pace that would have been a comfortable walking speed in my old office in Annapolis or around my home. I’ve called the Beam a “fairly simply robot” because it doesn’t have arms that can manipulate objects. It can’t help out on an assembly line or even open doors. Its controls allow it to be moved around while showing the operator’s face at the remote site and the space in front of and around the Beam at the other. Of the two Beams I drove, one gave me a little more stature and a larger face when I dealt with people in the office, along with some more advanced controls. Both were easy to operate. I was also easily able to “park” the device that I was using at the end of my visit, getting it back to its charging station. Most of the parking operation was automated once I moved the Beam into position in front of the parking spot. And, of course, I did all this while sitting at my desk and using an app supplied to me prior to my test drive. Driving one of these robots, you can move around offices, attend meetings, meet and greet remote coworkers or clients, and get a feel for how the remote office is organized. You can move through doorways and down halls with ease. One view allowed me to see not only where I was headed but to follow what is called a “predictive path” — curved lines on the screen that showed me where I will be heading if I continued in my current path. In fact, that view was very much like the backup camera view in my car that makes backing up much easier because I can easily tell if I’m moving along a safe path or am about to run into another car. In addition, jumping onto the Beam that was reserved for me and then, later, to another model was extremely easy and the entire time my connection was smooth and flawless. Just about any staff member who needs to interact with remote staff or customers can benefit from telepresence technology — even sysadmins. Back in the days when I worked in a busy IT office and had colleagues in about five widely separated office locations, it would have been very helpful to have been able to visit the other offices and interact with my colleagues face to face. It was far too expensive and time consuming to travel to Seattle or even Florida from Annapolis except for very important meetings. 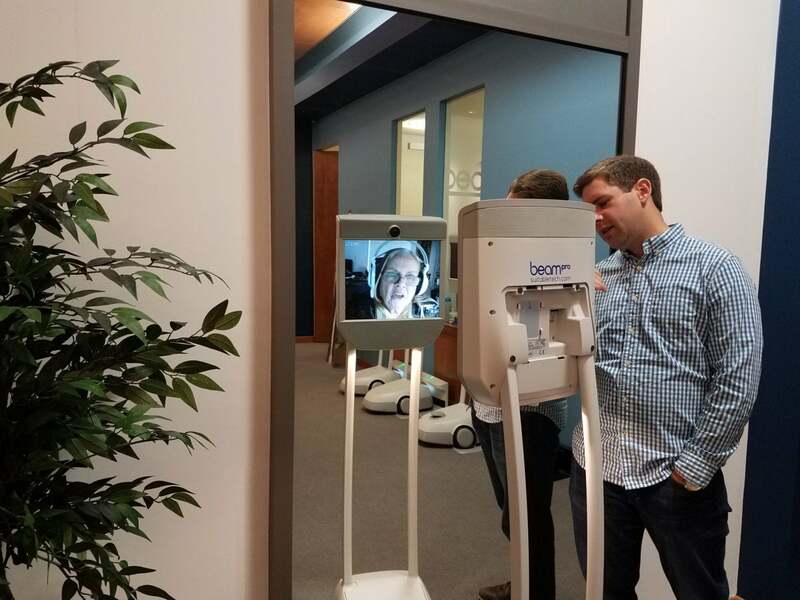 With a robot in place at each location, however, staff in Annapolis could have reserved one of them from time to time to spend virtual time at one of the other locations. In fact, this is how Jeani Vance, CIO of Prophet’s Chicago office, described how they use their Beams. They have a unit ready at each of a number of international sites (San Francisco, Chicago, New York, London and Hong Kong) and allow their staff of 300 employees to reserve them as needed — saving money, as well as their workers’ energy. From my experience as a long-time technical worker, getting to know coworkers and customers on more than a phone-call basis makes it easier and more comfortable to talk with them. Teleconferences help, but the comments that people make when exiting meetings and heading back to their offices are often as valuable as any they share during the meetings and being part of those conversations can be invaluable. Saving your company the cost of airfare and hotels is only a small part of the story. Establishing a presence at a remote site while sitting comfortably in your office and taking part in the casual hallways chats is an altogether different level. In addition to helping companies that have many sites or an international presence, I would love to see this kind of technology available to people who want to visit family at remote nursing homes or hospitals, to visit with doctors, lawyers, teachers and others. Maybe someday this will be common. In any case, my test drive was very enjoyable, and I was surprised at how quickly I felt very comfortable driving the Beam.